In Professor Child’s Children and Divorce series, children teach others about divorce by sharing their personal experiences. They describe what divorce means to them, how it has changed their lives, what has helped, what they love most about their families, and much more. Viewers will be left with a sense of hope and an understanding that they are not alone in experiencing divorce. Each volume includes a companion CD-ROM workbook with numerous discussion questions and creative exercises corresponding to the film. In Volume 1, The Experience and Feelings, chapters include What Divorce Means to Me, How I Heard, My Biggest Worry, Things That Help, and If I Had a Magic Wand. In Volume 2, The Transition, chapters include What Has Changed Since The Divorce, My Parent’s Relationship Now, Caught in the Middle, and Back and Forth. In Volume 3, Ways To Cope, chapters include Advice to Kids, Advice to Parents, Hopes and Dreams, and I Am. 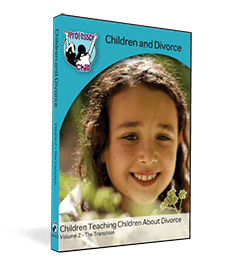 The Children and Divorce curriculum workbook includes over 30 pages of thought provoking discussion questions and creative exercises. It is broken down into 13 chapters that correspond with the video. 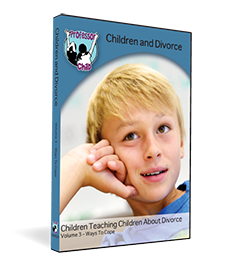 This extensive workbook covers various aspects of divorce and will be a wonderful tool to help your child work through the healing process. If you are interested in streaming the Children and Divorce film series or individual volumes for an event or private screening, please contact us. experience during divorce, but may not feel comfortable communicating to their parents. The producers understood that children have much to teach their contemporaries about what has happened to them and their families, and have let them share their experiences, both good and bad, and offer advice to other kids and to parents. It was a gift to have some insight into children’s perspectives, their memories and their feelings. It made me realize how they view divorce and their current situation.